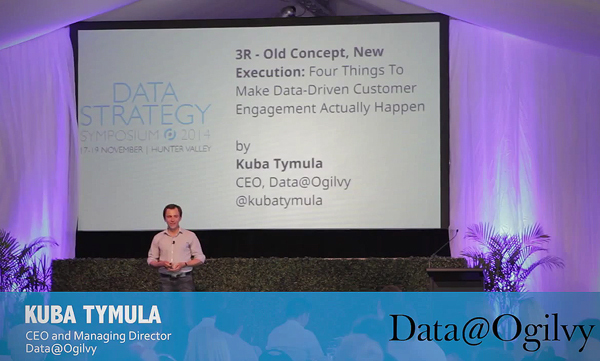 In today’s post, we present the highlights adapted from the presentation given by Kuba Tymula, CEO and Managing Director, Data@Ogilvy. 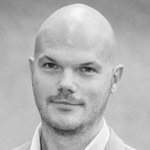 Kuba talks about the ‘3Rs’ of customer-led marketing – the right message to the right customer at the right time – and the four layers you need to tackle in order to make 3R happen. Kuba also reveals why 3R is an opportunity way to change the transactional approach to relationship marketing. 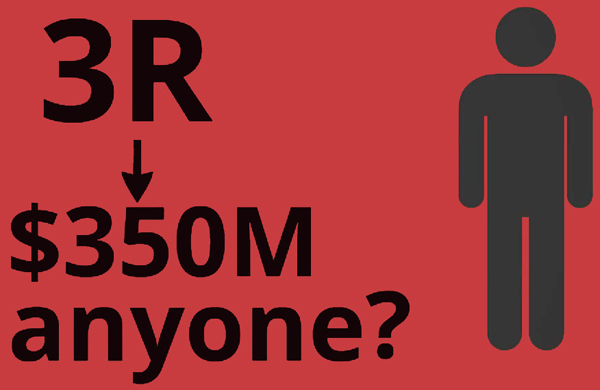 3R is important because it makes money. It’s the best and fastest way to really commercialise the data that you have. What I’m going to be talking to you about is not just the data, but the things surrounding it that you need to make happen before you can successfully make money out of data. Using a sporting analogy, my personal best using the 3R approach was $350 million – that’s the incremental growth achieved for a bank in the U.S. about three years ago, over a period of two years with some very humble beginnings. Channels are proliferating. It’s not just Myspace and Facebook anymore, there’s Instagram and things that the kids are running around with that we probably haven’t even heard of yet, but there are pockets of people that are very excited about those. 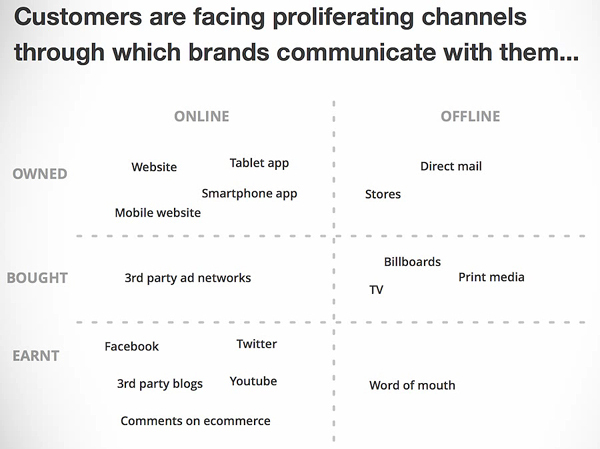 The problem with all these proliferating channels is that each one of them tends to send out different messages to customers depending on the channel, or the people responsible for managing them. For example, the email guy sends emails on the targeting that he believes is right. Instead of that person receiving his email, they might get a completely different message about a different product, a different offer that is meant for a different customer segment because that particular channel manager had a different idea about what the right message is. 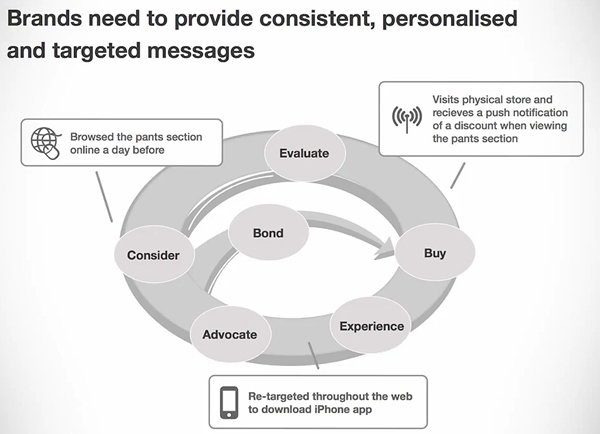 A single, targeted message needs to be delivered to your customers regardless of the channel you are using, and you need to know where they are in the customer journey. Brands need to start acting across the customer journey and pick up all the crumbs of data around that, in order to take people across that journey. The top of this customer decision journey, as it’s called, is the Consider, Evaluate, and Buy stage. It doesn’t end there though. 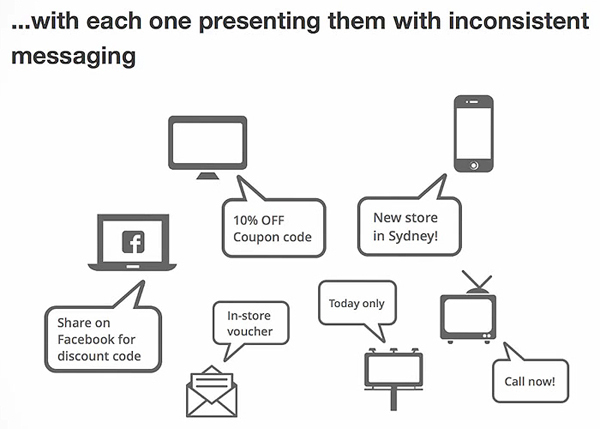 Most of the brand interactions for people come after they have purchased products. Research indicates that 50% of women will continue researching the face cream that they bought online after the purchase. All of this experience of the product and the messaging that they’re getting after they have purchased the product might make them become an advocate for the product. Obviously, it’s great if this is a positive advocacy, where they don’t need to go through the consideration and evaluation purchase cycle again. Instead, they will then go through what I call a “loyalty loop” and a bonding stage. For example, Toyota and Lexus, they do the loyalty loop very well. Coca Cola versus Pepsi is another. You do not decide to have a Coke. You do not decide, “Well, should I go with Pepsi? Should I go Coke?” You’re either a Pepsi person or you’re a Coke person. You are a loyal advocate of that brand. 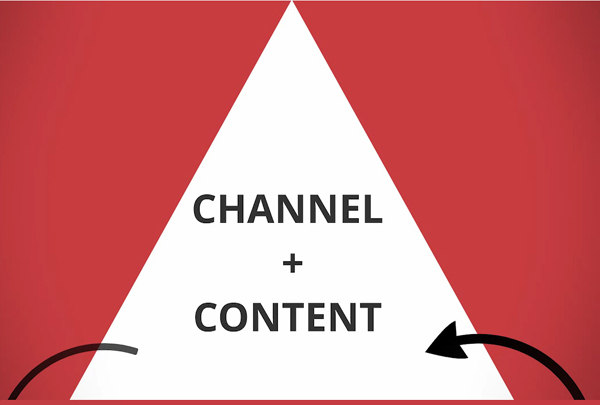 Channel and content is the first layer of the puzzle. This layer is closest to the customer. You can imagine the customer sitting at the top of that pyramid. 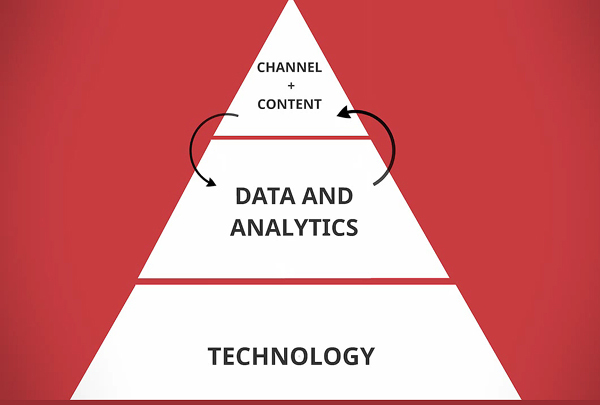 Data and analytics is the key to making this channel and content well-informed i.e. that you are serving the right message to the right customer at the right time. 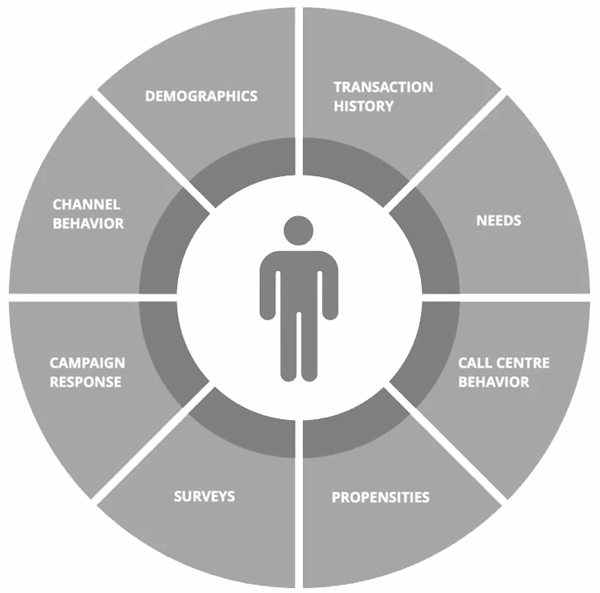 Every single customer interaction creates data. You serve somebody a message with a call to action, that person clicks on it, that’s a piece of data. That person doesn’t click on it, that’s a piece of data too. The aim is to structure and analyse your data in a way that closes the feedback loop. Every single customer interaction feeds in through your data layer and then back to the channel and content, so that every single customer interaction improves the next interaction. You start with mashing all the data together by putting all the data into a 360 customer view. Combine all the transaction history you might have on a person plus all the service information you might have on them, the campaign response, their channel behaviour when they’re browsing, and third-party data sources such as Tipstone which is an incredible source of data for so many people. In the U.S., you would probably plug in BlueKai, or you might consider Experian or some other providers. In order to make the first two layers work you need to have the right technology. The marketing cloud is part of it but you need to cover every aspect. You can have the most targeted message created in a database somewhere but if you don’t deliver it on time it’s not going to matter a lot. If your emails don’t reach people at 1pm, which is the window of time you need to reach them in, that’s a problem. If your email engine doesn’t have the capability to target people by time, and those emails just get there randomly over the course of 24 hours, that’s a problem. A lot of you might actually understand what these things are, but CEOs or CFOs that are signing these things off, really do not. 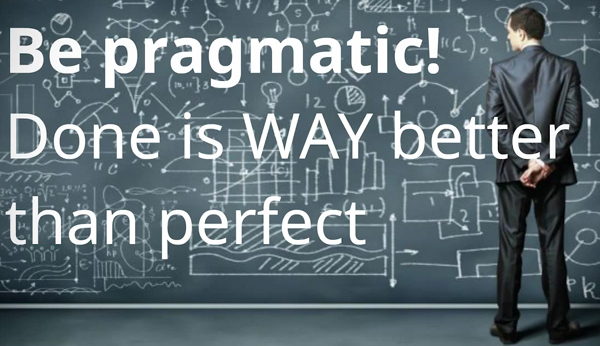 You have to be super-pragmatic in explaining to people what it is that you’re trying to do before they actually agree to do anything. 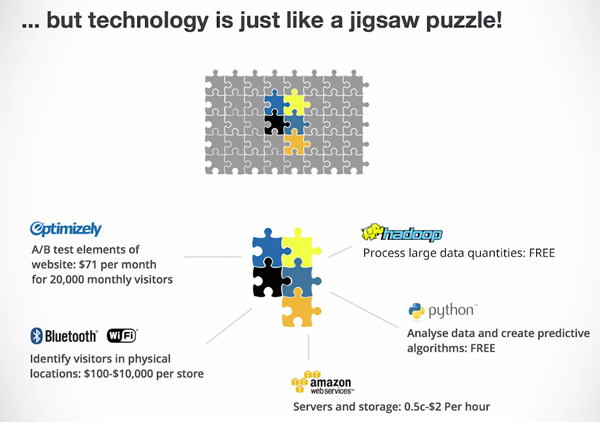 Technology is a jigsaw puzzle. You don’t have to have the best thing out there, it just needs to work and work quickly. Don’t worry about creating a Rolls Royce. A 20-year-old Toyota Corolla is going to get you from point A to point B much faster than building 15% of a Rolls Royce. Ten years ago if you wanted to have an A/B testing solution it would have taken a team of 10 people six months to build something. You literally had to build it from scratch. These days 71 bucks a month will do 20,000 tests for you. It’s literally as easy as dropping a line of code onto your website. How do you get the right operating structure? With so many tests, you need a war room. Steve Jobs famously said that there is a right size for everything, and it’s probably smaller than you think. The weight on which we operate is the agile start-up; it’s the 3H way – hacker, hipster, hustler. You start with one of your two hackers; your data analyst gets some data, runs some segmentation and identifies the testing opportunity. It then goes to the hustler, the marketer, the last throat to choke who looks at the testing opportunity and works out the budget, relevance and approach. Then it goes to the hipster, the designer or copywriter who makes sure that everything is looped together. Then it’s going to go to the programmer. 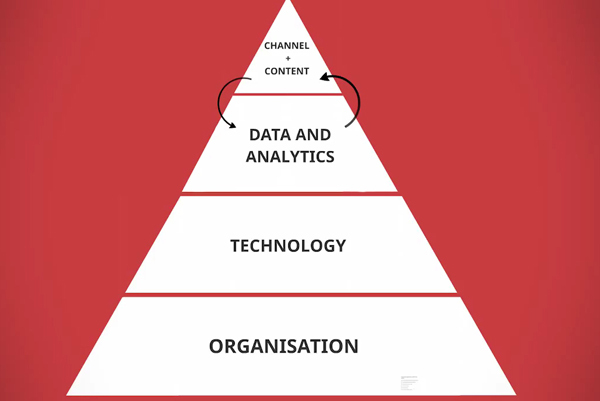 You can have the greatest technology in the world, the greatest data analytics in the world, and the best designed customer engagement strategies, but it’s not going to matter a single bit if you do not have your organisation right. My acid test for an organisation is a single question – How many tests did you run last week? Unless 70 per cent of all your tests are failing, you’re not pushing hard enough. Transforming an organisation is not rocket science; you just need to program to make it happen. Your data might be the most beautiful but if people in the organisation are not using it what use is it to you? Test and learn. Expect that about 70% of your testing will fail. 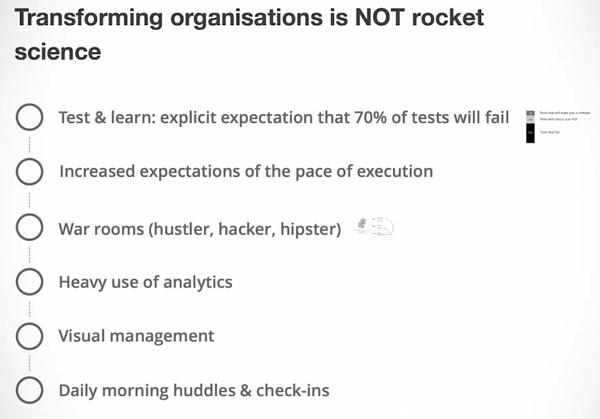 In my experience, if you push to a point where 70 per cent of tests fail, then 20 per cent will continue getting your status score ROI, but that extra 10 per cent will make you a rock star. Every single thing that you do is data-driven. If you think about the philosophy for 3R, there are digital channels and there is data. What you need to remember from digital channels is to ruthlessly test. You do not do anything unless you test. There are ways to go about this, there are ways to test stuff in store and out of store but you should not do anything unless you test it. Testing will allow you to sort everything that you’re planning to do. You could then say, that’s the ROI on this one, I’m going to do this one first, before I move on to the next best ROI, and the third best ROI. By the way, I’m talking about the age of the infinite marketing budget. You need to decide what your ROI benchmark is and what you’re going to feel comfortable spending and where you are going to do all these things. If it requires a $100 million marketing investment, who cares if we’re making 300? This definitely changes the conversation between the CMO and the CFO. The reason why the conversation changed is because CFOs are thinking, “Well, yeah, he famously told me that 50% of my marketing budget fails; you just don’t know which half.” Well, actually we do. It’s 21st Century, and we can pinpoint exactly which stuff is working, and which is not. We do want to spend some money on testing, and we know the stuff that is not working. We want to keep it there. It allows us very valuable lessons to feed into audits. The problem is that the people needed to make marketing happen are not sitting in the same room or city. It’s lucky if they sit on the same floor, and I’ve been in situations where they sat not in different cities, but in different states. They’re also not working fast enough. 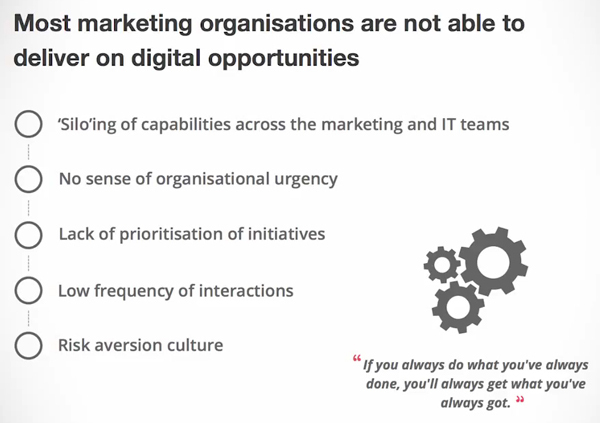 Organisations need to create a sense of urgency to move faster. You want to have a highly performing team that’s super-energised and unless you prioritise ruthlessly and based on data, you’re not going to succeed. That’s one message. Another message might be, “Those seven that failed cost me $2,000 and those two that succeeded and have made me a shitload of money. 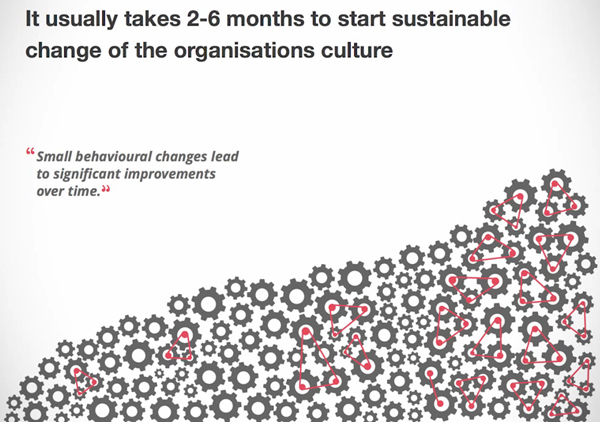 In my experience, the journey to turn around the culture of an organisation is anything from 2 to 6 months before you start seeing some impact. It all depends on the size of the team. Success with data comes down to small behavioural changes. Some cycling enthusiasts might be familiar with the Dave Brailsford’s theory of marginal improvements. In 2010, Brailsford was given the job as manager and performance director of Sky Team Pro Cycling to improve Great Britain’s chances of success on the track. He took his team and said, “I’m going to improve every single thing that I can improve. I will make one percent improvements from changing pillows for athletes to swapping massage gels and reducing the weight of tyres by 12 grams. By 2012, team members started winning. Why is this important? Because when you take a 1 per cent gain to the power of N, you start getting a geometrical curve, and as you go up the curve the results become more meaningful. Visual management using dashboards are all the rage. It allows people who have the smarts and the analytical minds to give the data to other people that are less analytically savvy. Daily morning huddles and check-ins are important. As I said, this is right message to the right customer at the right time. In my experience, you’re talking about a 10 to 20% increase in EBITDA over 18 to 24 months for a B2C company. These are the goals that you should have in front of you.